RUSSIA-CHINA ALLIANCE. Beijing announced a Russia-China naval exercise in the South China Sea next month (“routine”, “not directed against third parties” of course). As I’ve said before: the lasting effects of a decade and a half of neocon influence (apart, of course, from lots of losing wars) will be the Moscow–Beijing alliance and the increased power of Iran. PUTIN DERANGEMENT SYNDROME. Clinton “knows” he did it but the DNI doesn’t, confirmation bias says another, not Russia says Debka. But it diverts attention from what the e-mails actually reveal, doesn’t it? I am going to collect PDS examples all month, but I can’t resist this one from July: “Russia’s war on drugs is hurting America“; maybe you can follow the logic, I can’t. In the meantime enjoy Mark Sloboda’s list of individuals and political parties that Putin secretly controls. OLYMPICS. The IOC rejected the blanket ban of Russian athletes. I haven’t bothered to follow the story. Seen it before: Milosevic, Libya, brown water. My default position nowadays is that it’s all lies. “WINNING THE INFORMATION WAR”. I’ll leave Paul Robinson to dispose of it: he’s politer. Danielle Ryan mocks. But you don’t try to silence the other guy if you’re winning the argument, do you? BREEDLOVE. Speaking of the “information war”, I told you the “evidence” of Russia’s “invasion” was rubbish. “The newly leaked emails reveal a clandestine network of Western agitators around the NATO military chief… The emails document for the first time the questionable sources from whom Breedlove was getting his information. He had exaggerated Russian activities in eastern Ukraine with the overt goal of delivering weapons to Kiev.” The leaks are here. One of his sources was Phillip Karber who had a (swiftly backtracked) connection to this idiocy. CRIMEA. Outrageous of Trump to say Crimeans are happier in Russia? Gallup (28) agrees and so does a German polling organisation. And plenty of others too; French parliamentarians the latest. Not Nuland, though: it’s a “reign of terror“. UKRAINE AND HISTORY. The Polish Parliament has declared 11 July a “National Day of Remembrance for Victims of Genocide committed by the Ukrainian nationalists on citizens of the Second Polish Republic”. At last an important Jewish publication notices who the heroes of new Ukraine are. And a little reminder of how many of them died in their beds in Canada. TURKEY. The purges continue. We have the interesting statement from the US DNI that “Many of our interlocutors have been purged or arrested” in Turkey. The US general in charge of the area is also concerned about the effect on the “level of cooperation and collaboration”. There are rumours of coming agreements between Ankara, Moscow and Tehran. We will learn more when Erdoğan and Putin meet next week. My take on the coup attempt here: in brief, it was a real coup; Ankara blames Washington; it’s a big geopolitical change: I think Ankara has recalculated costs and benefits. The official line is that the pilots who shot down the Russian fighter were plotters and they have been arrested. Is Davutoğlu being set up to be the fall guy? SYRIA. US weapons found in a warehouse in Aleppo – including TOWs which are not trivial weapons. All the CIA’s man in Syria knew when he took the job was that Syria was “extremely complex”; nevertheless he set up a scheme to overthrow the government. THE EMPTINESS OF FORMER FLAPS. Slobodan Milosevic has been cleared. Once Newsweek’s “Face of Evil“, found guilty by “human rights” organisations and a child killer, he spent years on trial and died in jail. Ah well! Mistakes happen and that was all a long time ago. Albright and Clark made some money, Hillary Clinton landed “under fire”, the US got a big base, criminals got a whole country and jihadists got some training camps. So it all worked out in the end. The very same people are telling you the very same stuff about Putin. 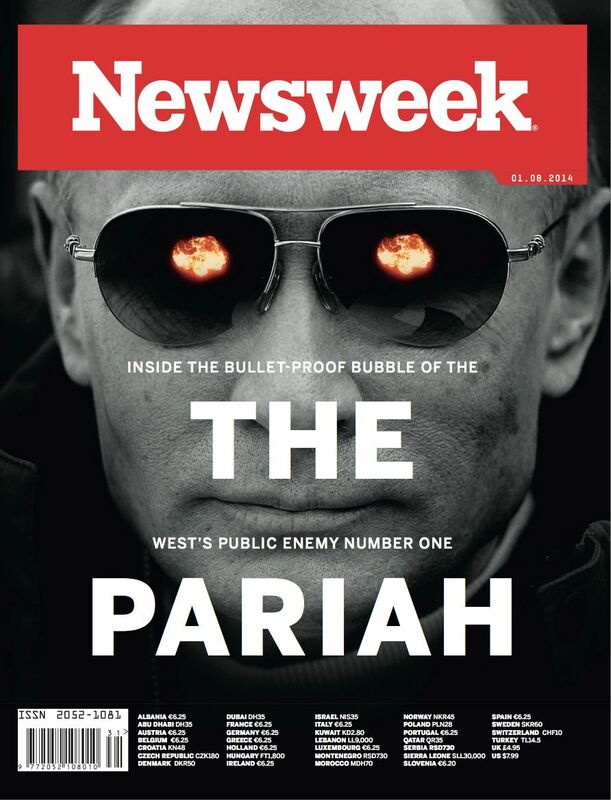 Check out the links, Dear Readers, unlike the NYT I don’t make stuff up: yes, Putin is Newsweek’s current monster, yes, “human rights” organisations (the same one, amazingly enough) find horrors in Crimea and yes, they say child murders. Same same. Milosevic died 10 years ago and now we learn. (“Murdered” is, of course, just a crazy “conspiracy theory”). ARMENIA. Was that another failed colour revolution? Andrew Korybko, whose guidance I follow on such matters, thinks it may have been. Anyway, it seems to be over. Maidan may be the last of the series.